Me and my wife, who loves shopping and is a budget hunter, went to Divisoria last weekend. And guess what we saw along the road…a mysterious billboard along Morayta which says “Maghihintay Ako - Manuel“. In addition, it has “EDSA, Shangri-la Hotel” and the date “May 22, 2015” at the lower right corner most probabaly implying the location and day of the ‘meet up‘. Edsa Shangri-la Hotel is a hotel in the Ortigas area in Mandaluyong. 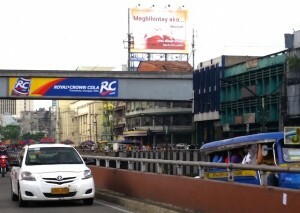 Amazingly, we saw another similar billboard near Recto on the same day! Is this a coincidence or what? 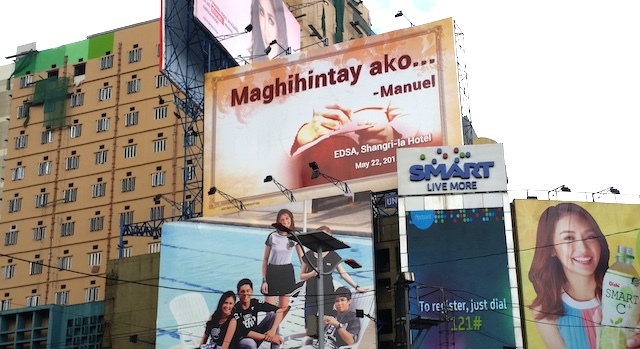 What do you think of this “Maghihintay Ako – Manuel” mystery billboard? Is this a similar promotional billboard again or is it an individual / person behind this and he just wants to send his message across for his love one in a unique way? Share with us your thoughts and feedback in the comment section below! Pwede noh? Kasi sa EDSA Shangri-La ung venue. Whether it’s an ad or the real deal, it’s genius. That’s really great! It’s always interesting to see where billboards are placed in some places. I love the look of the billboards in Tokyo and NYC. I know, that’s a little strange. Now I suddenly want to see the billboards of Tokyo and NYC! I would love to think that it’s an individual declaring his undying love! But I’m sure it’s some kind of marketing promotion. That billboard did a good job since it got all of us talking about it! I am curious what the outcome is. 2 days to go and it will be revealed! It’s got to be a promotional thing. It makes people remember it and think about it and that’s the point of marketing. I wonder as well what is the promotion about. That is cute and will certainly catch attention. I hope that Manuel gets to deliver the message to whoever it meant hehehe. Who do you guess is Manuel? Wow, the person behind this is great at marketing. It would have gotten my attention, too! Yep, attention grabber! Great way to get the message out that’s for sure. I think it’s for sure a marketing tool, because now people are talking and wondering! Very interesting! I’m not sure if I could afford to do a billboard for the person I love but lol if you have the money, why not?! Omg such great marketing there!!! To succeed these days you have to get more and more creative with your marketing and this is exactly that lol! I am sure it’s just some kind of marketing ploy. It worked, though, because it got your attention! I had a great time to read this, yes I agree with Robin it’s just a kind of marketing. I’m with Robin, it probably is some sort of marketing plan! It is quite the attention bringer, it makes you really wonder who these people are and what they mean. Yeah, who could Manuel be talking to? Wow! If someone wanted to send a personal message they sure shelled out a lot of funds. But it got the attention it deserved! A giant personal message at that! It’s definitely a big attention grabber, which is perfect for billboards. I’m not familiar with the reference though! The reference is a mystery at the moment to be revealed on May 22 here in the Philippines. What did you google about? This would be an amazing way to get a message to a loved one. I hope it is not another ad campaign. A very clever and interesting way to send out your message. A good way to propose to someone special. yeah, a proposal is a possibility. This is a great marketing ploy!! I bet people are goggling and searching for this like crazy. Genius!! I have to admit, I am torn as to which one it is. A part of me thinks it is an individual and another part thinks it may be a marketing ploy by a company. either way, it is pretty slick. I’m pretty sure this is a marketing campaign leading to a launch of a new product or service. And, it seems to be effective. I bet all the people who see these billboard everyday are excited for the big reveal. I dunno…but it’s done it’s job in getting you wondering. I think the cost of them is so high, but they are definitely very effective. I’m with you in that Rosey! Now that’s a great campaign, pretty smart of the pr. “pretty smart” – love the phrase! If it’s from an individual, I would certainly give him an award for the sweetest man alive. Seriously though, I think that’s just a marketing strategy. Such a nice gesture. I agree with some of the other commenters. Maybe a marketing ploy? But that’s the cynic in me. Maybe it really is someone missing another person! Marketing or not, its totally sweet. Lol, I love that sort of thing! My first thought was maybe that it was Manny Pacquiao waiting for Mayweather to stop hugging him and start boxing, but I don’t think that’s it. It’s a great attention getter, whatever it is. Haha, I love the Pacquiao-Mayweather association. It sounds like a romantic gesture to me. I hope it works this time. a very public romance at that! I’m always amazed at the different ads that people come up with! This one is really creative! Thanks for sharing. it’s past May 22… Nagkita na ba sila ni Manuel? Yes they did! Wait for the story in the next few days!